Escape radical winter and summer temperatures, dreary landscapes, city and highway congestion in this beautiful semi-tropical yet temperate fantasyland. All day long the thrilling vistas of rolling hills, forests, and pastures, lake, mountains, and especially the famous Arenal Volcano give recurring pleasure in the natural beauty that surrounds you. Forget winter clothing and summer air conditioning for a simpler, less expensive life where the usual temperatures range from the low 70s in the early morning to the low 80s in the afternoon. 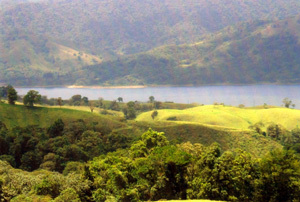 This lot is part of a small development about two miles into the hills above the village of La Union (site of the well known attractions, La Mansion Resort and Toad Hall Gallery and Restaurant) on the east side of the lake, midway between the dam at the volcano end of the lake and the town of Nuevo Arenal to the north. It's ready for your vacation or permanent home with water and electricity already available at the property's edge. The views are spectacular and the quiet privacy restorative. It will be a pleasure to plan your home for this site. Then enjoy adding trees and flowering tropical plants that will swiftly grow in the warm climate and good soil. This slightly canted Google Earth image shows the location of the hilltop lot on the east side of Lake Arenal about 40 minutes from the famous Tabacon Hot Springs and the volcano. The tourist center town of La Fortuna is on the opposite side of the volcano at upper right. 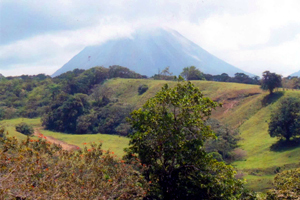 The town of Nuevo Arenal is a few miles up the lake highway to the left. Even without the lake and the volcano, the terrain is beautiful. With them, your surroundings are among the most magnificent in the world. To the left in this Google Earth image is the village of La Union, home of the well known tourist favorites Toad Hall Gallery and Restaurant and La Mansion Resort. From this point on the paved lake highway, a secondary road leads to a small development where the half-acre lot is spectacularly situated.